Mikaberidze, Alexander. The Battle of Borodino: Napoleon Against Kutuzov. London: Pen & Sword, 2007. 276 pages. ISBN-13# 9781844156030. $50/£25. Hardback. Reviewing a book can be a complex exercise requiring effort that is often in inverse proportion to the quality of the work. A well researched and written book is a joy and writing a review seems effortless; a poor book demands carefully prepared criticism, outlining its deficiencies, while not appearing to be a diatribe. Every once in a while there comes an exceptional book, presenting fresh perspectives and new information that leaves a reviewer lost in thought, gazing out a window, pondering the significance of the work and how best to describe it. Alexander Mikaberidze’s The Battle of Borodino: Napoleon Against Kutuzov is simply that. It is an incredible, compelling and masterful examination of one of the most interesting battles of the Napoleonic Wars. The author provides a detailed study of the Battle of Borodino using many sources that have never before appeared in English. It is also a delightful exercise in historiography that expresses fresh perspectives, revealed by the presentation of new information against a careful re-examination of the established narrative. This takes time to digest and gives reason to pause momentarily, reflecting on the author’s arguments, and even rereading various sections of the book again. This is the treasure of the book. Dr. Alexander Mikaberidze was born in Georgia in the former Soviet Union and studied under Dr Donald D. Horward at Florida State University. He has published extensively in the field of Napoleonic studies and is perhaps best known for his magnificent Russian Officer Corps of the Revolutionary and Napoleonic Wars. He also taught European history at Mississippi State and Florida State Universities and has lectured at the US Naval War College. He is currently an assistant professor European history at Louisiana State University. A great deal of information is presented in this book, often summarizing statistical data regarding the battle, first hand accounts by participants or observers of the battle and previous interpretations by Russian, British, French and American historians. For example, there is a summary of the casualty figures for Russian and French forces as estimated by 25 different historians and the year in which those figures appeared (p. 212). Another similar section (p. 49 – 64) considers the strength of both armies, the experience of the soldiers and the quality of the leaders by using tables, charts and graphs. The Battle of Borodino is not without controversy and, as Mikaberidze demonstrates, this erupted as the Russian deployed into their initial defensive lines, including the establishment of the Shevardino Redoubt, and their main positions further to the east. Barclay de Tolly was convinced Shevardino was a waste of effort and manpower while the main line was poorly placed, exposing the left flank. Kutuzov’s reluctance to adjust the line before the fighting began would have important consequences during the battle. Several of these controversies and the problems with the historiography are attributed to deliberate efforts by some Russian commanders to “cover up some of the miscalculations and errors made in the initial deployment at Borodino as well as later battle decisions” in order to satisfy imperial or communist nationalistic aims or simply save reputations (p. 115). Thus the time and duration of the defence of the Bagration flèches went from occurring between 7 and 10 am, to lasting until noon and finally continuing into the afternoon. Thus the commander of the 2nd Army, General Bagration, was not, as most historians’ claim, wounded around 11:30 am, immediately before the French attack on Rayevski’s Redoubt or at noon following the first French assault on the redoubt; Mikaberidze places this event two hours earlier, just as French attacks worsened Bagration’s situation, requiring the need to move reinforcements from the north that “took the entire second line” from Rayevsky, thus compromising his ability to defend his sector, which soon fell (p. 114-117, 120). The book has many other similar discussions that will be left for the reader to explore. 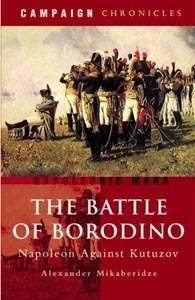 It is the author’s solid research, wide range of sources and new perspectives that makes The Battle of Borodino: Napoleon Against Kutuzov such an important book. The sheer number of Russian language sources used is impressive. Napoleonic scholarship demands more work like this, with authors capable of working in a variety of languages, allowing them to re-examine previously used sources with other documents and studies that have since become available. The book includes several interesting “text boxes” exploring a variety of topics, such as “What Time Did the Battle Start?” (p. 90) or “Who Fired First?” (p. 91). Another is titled “Leo Tolstoy and Borodino,” (p. 176 – 177), exploring how Tolstoy’s War and Peace generated “a powerful mythology that, in fact, overshadows historical reality and assumed the authority of a historical document” (p. 176). There are several editorial oversights, undoubtedly attributable to the publisher, such as a note asking readers to refer to “page 000” for a discussion of Ney’s attack during the mid-afternoon (p. 160). The most unfortunate changes the name of Dr Donald D. Horward, the doyen of Napoleonic historians in North America and Director of Florida State University’s Institute on Napoleon and the French Revolution, to “Howard” (p. xiv). Don’t worry about the editorial oversights. This is an important book. Get it, read it, study it and be ready to learn something new. Review by John R. Grodzinski.